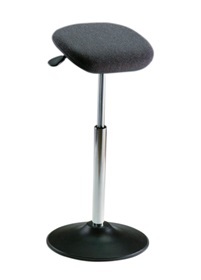 Milagon® Standing Support Stool is designed to provide ergonomic physical relief to any employee whose duties require standing. ESD grey fabric and cushioned work seat assembly. Mounted on a high gas lift and 17"-diameter enamel disc base with polyurethane edging.